Although ‘officially’ past that awkward inbetween length, my hair still feels very much like it’s making me endure the teenage years. Up until 18 months ago, I’d had long hair my entire adult life… but along came a baby and with her; dribble, snot, vomit and spitup – most of which used to end up coating my locks. I’d like to say that I’ve loved having short hair, I know that in theory… a neat, slightly-angled bob has always suited my round face better than heavy curtains that hang down either side of my hamster cheeks… but theory is called theory because it’s the opposite of practice. I simply haven’t had the patience, inclination or time to style my short hair and stop it from looking untamed. I’ve spent the last 18 months with what amounts to a bad hair day. My feelings on this were hugely reinforced on Saturday when I attached the human hair extensions that I was sent by Halo Hair Extensions. I’m a total hair extension n00b and have never considered myself a hair extension kinda girl. I opened the package… looked blankly at the strands of hair infront of me and quite honestly thought “what the hell did I go and agree to give my feedback on these for?” Curiosity would be the honest answer to that question. First things first, did they even match my hair? I held them up alongside my mane and Mr. L answered in the affirmative. Obviously, you don’t trust a man’s opinion on such important matters so I hot-footed it to the bathroom and checked for myself. I was sent this set in darkest brown and it’s a damn decent match to the ends of my hair… no ombre here (apart from the overprocessing I’ve done to my self). I spread the 8 piece set out on the bed infront of me, marvelling at how the softness put my own to shame and wondering if the coarseness of my rough locks would look odd in comparison to the pieces I was about to “install”. 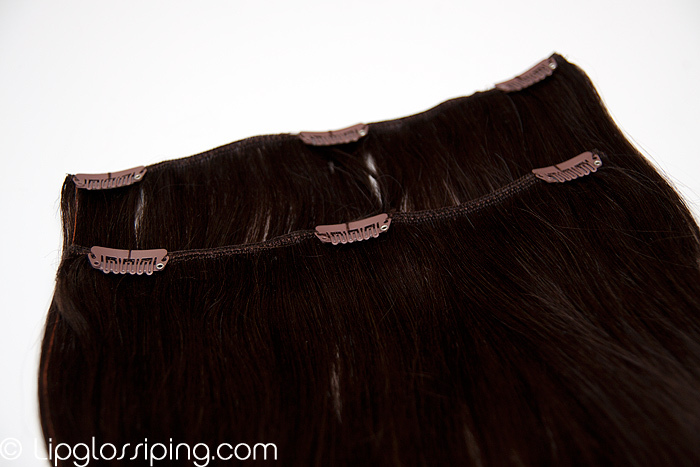 The set I received contained: 2 pieces of hair which are 8” wide (with 3 clips), 2 pieces which are 6” wide (with 2 clips) and 4 pieces which are 2” wide (with 1 clip). I started with the widest pieces at the back, parting my hair horizontally with a rat-tailed comb and clipping them to my own hair. I’m rubbish at describing things like this, if you’re as clueless as I was, I suggest that you go and watch one of the how-to videos on their website for more insight and tips into how they actually attach. Once in, they felt secure and I was able to brush through gently with my hairbrush to blend my hair with the extensions. 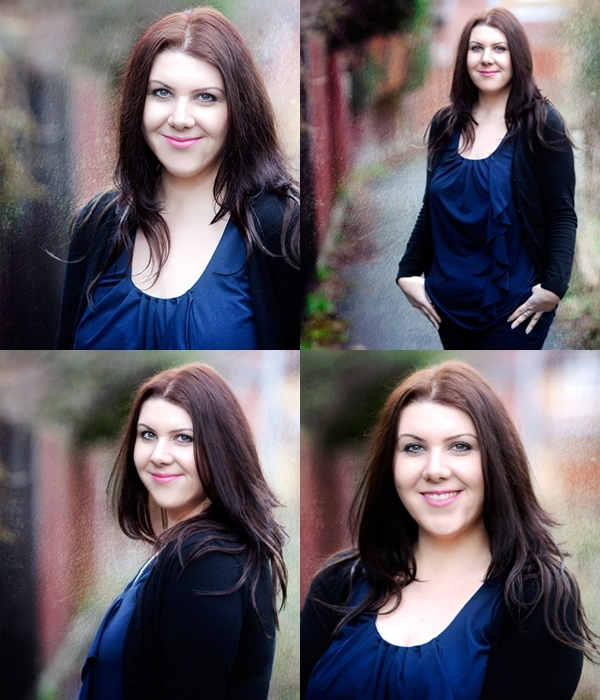 It frankly felt amazing to have such thick, luxurious feeling hair… what a confidence boost. I admittedly spent the entire day asking my husband if he could see the clips (he didn’t once say yes) but perhaps that kind of confidence in wear will come with time. Wanna see how they look? Bear in mind that this was my very first attempt at putting them in and they literally took me 5 minutes from start to finish. I’m so impressed with how ‘usable’ they are, I really thought I’d struggle and turn the air blue trying to get them in but I didn’t enconter a single problem. I can see a ‘shelf’ at the back and I appreciate now that I should have included the other 3-clip piece that I left on the bed thinking that I ‘didn’t need it’. I’d contemplate trimming them just a touch to get rid of any wispiness from the ends. This is a real glowing review, I’m struggling to find fault with the product (and I always like to find at least a little fault! )… so I will have to be pernickity and state that I did have to spend a good 10 minutes ‘picking’ bits of fluff/tacky glue out of some of the wefts. 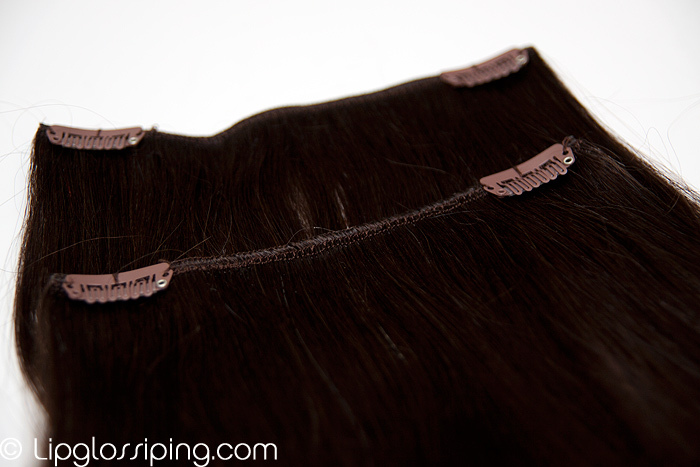 But that’s my only negative experience with these clip-in hair extensions from Halo Hair. Even the £39 price tag is reasonable… you could pay that easily for a decent haircut round my way. I wish I’d tried them sooner, I just didn’t realise how easy they would be to put in. 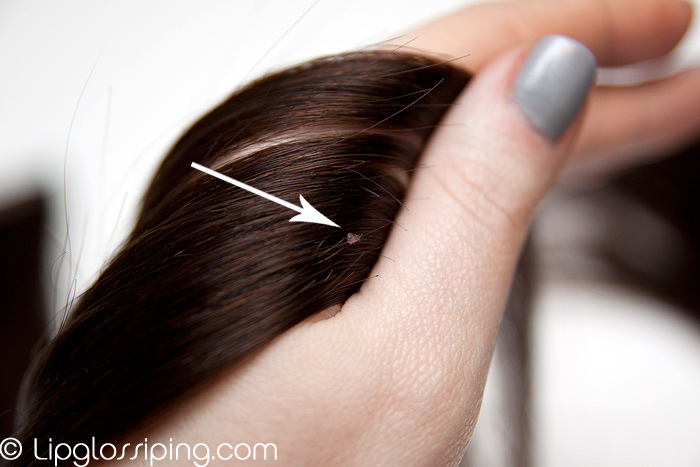 Do you wear hair extensions? Any tricks or tips to share? I probably would have given them a try at that price if I hadn’t gone and chopped all my hair off recently! I was sporting a bob up until 3 weeks ago (the lady at HQHair made it look so lovely! ), but I just couldn’t replicate that loveliness at home, so off it all came. Plus, I have bright red hair and nobody seems to do extensions in Shwarzkopf XXL Passion Red *sigh* I’ve always wanted long hair but have never stuck with it long enough to achieve results. I also meant to mention that they look extremely natural on you! You did well considering you’re a noob!! I really want to try hair extensions. About a year ago I had my long hair chopped off in favour of a bob. Looking back at pictures I massively regret my choice, even though I really suit a bob. I want best of both worlds. I have super thick hair though so I worry I would need a lot of hair for it to blend easily. I am torn between Halo extensions and Foxy Locks. They look very natural on you. When I was growing out my hair I longed for extensions but was so afraid that if I did get some that they would fall out somewhere. These look really good, you can’t tell at all and they’re not expensive. 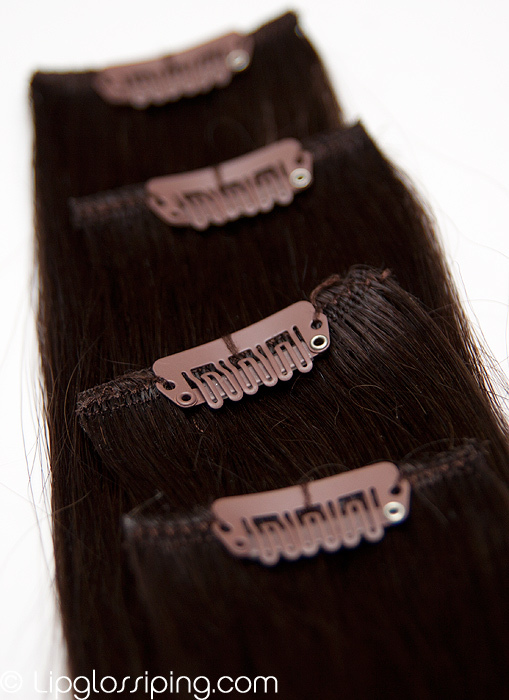 A friend recently spent over a grand on extensions and they look no different from these clip in ones. I so want these! I saw someone else doing a possitive review! Need to sort out my hair colour and then try them. Oooooohhhhh- i would love to try these! 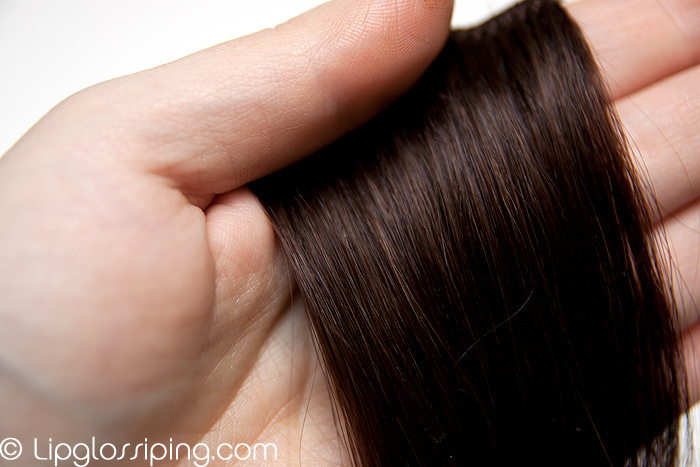 How long do you think your hair needs to be to use them? I never get past the awkward growing out phase as my hair tends to grow sideways and sort of shrub before gravity eventually starts to kick in. You look fab though- never would have known that it wasn’t your hair! I reckon you’re alright as long as your hair is past your chin. £39 is practically a steal too! Oh my God you look amazing, and seriously, was that the whole set for that price? I’ve got long hair anyway but something like this would be nice for adding a few layers and volume, so I’d definitely think about giving it a go. LOVE it! Hopefully now you can enjoy the best of both worlds… the ease of styling short hair and the joy of wearing long hair. Price is great, too. I looked into natural hair extensions and was finding prices well above $150. I find the idea of human hair extensions/wigs so so creepy! But that being said, you do look gorgeous! These look so gorgeous on you! You look fantastic! The hair looks good too.. BUT, you look so beautiful. 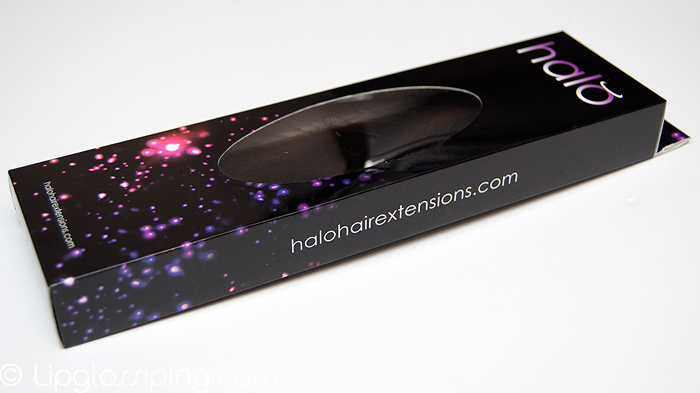 Your hair looks lovely BUT I have to tell you about my experience with Halo Hair Extensions. I bought a large quantity of the Halo and they are advertised at 100g however when we received it, it was only 85-90g and very gappy. So the owner of the company John R***o said to send it back and he would issue a refund. It took 3 weeks and tens of emails and phonecalls before we finally got some of our refund. He has not returned all of the money and we are still in dispute. He has been so rude saying I am not a priority of his and he doesn’t have the time for dealing with this! So please anyone buying from Halo Hair Extensions or John R***o be very careful! John R***o, this guy has himself down as businessfodda, he is a crook, he takes peoples money, ususally young girls for a totally uselesS crap piece of junk that passes as a product. He may aswell just take money from your bank account itS that obvious. HE HIDES ON A MAIL ORDER SITE SO HE CANT BE CHALLENGED FACE TO FACE AS HE WUDNT LAST FIVE MINS IN A SHOP. THE PRODUCT HE SELLS IS USELESS HAIR EXTENSIONS THAT LAST A WEEK MAX WITHOUT BEING TAMPERED OR ANYTHING ADDED TO THEM. THIS GUY THINKS HE CAN ARGUE OUT OF THE LAW AND THE LENGHTHS HE GOES TO PROVE WHAT NASTY PERSON HE IS. HE HAS NO DECENCY AND IS WRAPPED UP IN MAKING MONEY, HE REALLY IS SAD.. I also have a problem with this company.. i recieved the items FAULTY. clips are hanging off, and hair is sticking out due to sh*tty stitching. i paid £70 for these extensions and they are not good enough! John R***o tells me im not entitled to a refund because i’ve had them longer than 7 days!! DONT!!!!! Buy from Halo/ John R***o.
I also have a problem with this company.. i recieved the items FAULTY. clips are hanging off, and hair is sticking out due to sh*tty stitching. i paid £70 for these extensions and they are not good enough! John R***o tells me im not entitled to a refund because i’ve had them longer than 7 days!! DONT!!!!! Buy from Halo/ John R***o!!!!!!!!!!!!!!!!!!!! Did he ever give you a refund and do you still have the halo?